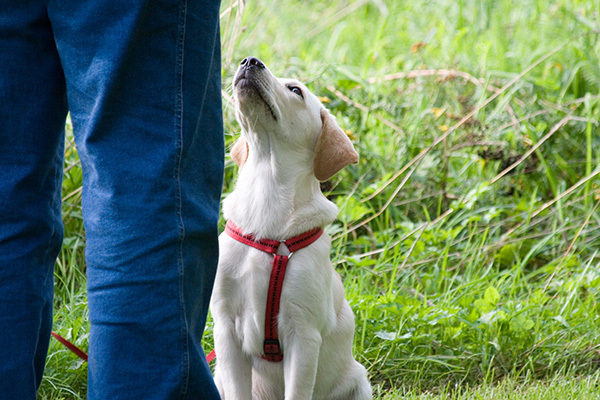 When it comes to traditional obedience exercises, the very first thing people are expected to train their dog to do is to sit when he is asked. Those of us who can remember the distant days of Barbara Woodhouse will never forget her endlessly repeated, and somehow faintly terrifying, catchphrase ‘Sii-iiT!’ (accompanied by a jerk on a choke chain and hefty shove on the bottom) — and for those who don’t remember her, think of a tweed-skirted, sensible-shoed cross between Cesar Millan and Dolores Umbridge! With these kinds of images in mind, it is pretty easy to see why people just don’t think it’s that important to train ‘obedience exercises’ any more. Surely it isn’t really that important if your dog sits or not? As we carry on this series looking at life skills — and why some exercises that we think belong in dog training classes actually help in our day-to-day lives with our dogs — we are going to take a look at the sit, and see just how useful it can be. The advantage of teaching your dog to sit is that while he is sitting, he isn’t doing other far less desirable things, like jumping on visitors, scaring small children (and quite possibly large adults), jumping up to steal food while you are preparing dinner, pulling you around while you try to have a conversation on the street, or running across a road (and dragging you in front of cars!). For people who are worried by dogs, a dog sitting nicely looks polite and far less scary. Plus it is an easy exercise to teach — and everything you teach your dog improves the bond between you. If you stop to have a conversation, having a dog who will sit makes it easier for you, and also means your dog is less likely to worry the person to whom you are talking. If you dog is in the kitchen when you are preparing food, having a dog who isn’t trying to jump on the counter is a real bonus — and if you are cooking or chopping things, it is far safer for everyone! It’s really important to have a dog who will sit when visitors arrive, instead of jumping on them. Note: some dogs can behave territorially or fearfully towards strange people at the boundaries of their property. Unless you know your dog is friendly to all, greetings at the front door are to be avoided. When you have guests in the house, you may want your dog to sit quietly and be polite. When you are out and about, being able to ask your dog to sit when you meet other dogs can be very useful to avoid you getting dragged into dog games, to keep meetings calm, and to allow you to have a conversation with other dog walkers. In the days of social media, having a dog who will pose for photos will make you the envy of Instagram! Start in a quiet location and, as always, with a treat your dog likes. Hold the treat on the end of your dog’s nose and lift it up and back slightly. When the dog’s head goes up, his bottom will go down. When it does, say ‘Sit’, and give him the treat. After a few repetitions, when you think he has ‘got it’, stop luring. Just hold the treat (quite high, around waist-height) and let him work out what it is that gets the treat. Don’t ask him to sit yet — but when he does, say ‘Sit’. You want him to put the word to the action. Reward as soon as his bottom hits the ground. Once he can do this reliably, move around and do it everywhere, in every room, in the garden, and out on walks. Practise with you in different positions too. Now you can start using the cue word to ask for the sit — and then reward him.